September 25, 2013 – Osborne Industries, Inc., of Osborne, Kansas, USA, announces that the U.S. Patent and Trademark Office has awarded Patent No. 8,511,257, on August 20, 2013, for the company’s unique Safety By-Pass Gate for the automated pig weighing and sorting system, the Osborne Weight Watcher™ Growth Management System. The Osborne Weight Watcher System, introduced in 2002, provides complete growth management of finishing pigs in large pens. An automated weigh scale, coined the Osborne Survey Scale™, sorts pigs by weight to enable target feeding, and automatically sorts market-ready hogs to cut sort losses and closely match packers’ matrixes. Pigs pass through the sorting scale as they naturally move between feed and water areas. 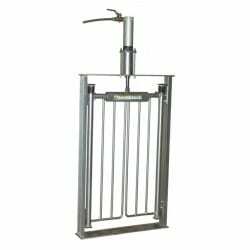 The newly patented Safety By-Pass Gate allows animals free access to the feed and water areas if an emergency event occurs. The gate automatically opens if the sort scale experiences less than normal activity owing to any type of system failure. An industrial strength air cylinder with features that prevent rusting, binding or fouling operates the gate mechanically during a no-power or no-air event. According to George Eakin, President and Chief Executive Officer, the concept of the Safety By-Pass Gate arose from over 10 years of research and development with the Osborne Weight Watcher System. The Weight Watcher System was introduced in 2002 at World Pork Expo in Des Moines, Iowa, at a time when feed prices began rising drastically. The unique capability of the system cuts sort losses by growing more pigs uniformly. Osborne Industries, Inc., based in Osborne, Kansas, USA, is a 100% employee-owned company specializing in the manufacture and development of advanced swine management equipment like the Weight Watcher Growth Management System. To learn more about Osborne Industries and the Weight Watcher System, visit osbornelivestockequipment.com, or e-mail info@osborne-ind.com.